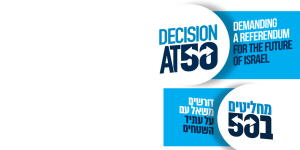 Today (Monday, September 5th) "Decision at 50" launched a campaign demanding a referendum on the future of the Territories and the future of Israel during the 50th year of Israel's control over the West Bank and Gaza. Under the slogan "It's time to decide," the movement will promote a large scale media campaign, accompanied by public events and direct action throughout the country meant to collect signatures of Israeli citizens in support of a Knesset referendum bill. "Decision at 50" was initiated by a group of organizations and individuals, including "Peace Now," "Blue White Future," as well as former security officials, former politicians, artists and social activists. The founders of "Decision at 50" believe that after 50 years of Israeli control over the Palestinian Territories, and after 50 years of indecision by Israeli governments, it is time to bring the decision to the Israeli public and let the people decide on their own fate: a bi-national state or two states, 50 more years of military rule or a diplomatic resolution. "This is the most sensitive and explosive issue in Israeli society today, and we demand that after 50 years we will get the right to decide on our own future. We cannot allow ourselves another 50 years of governments' indecision, during which decisions are made every day on the ground," the founders of the initiatives say. Among the supporters who already signed the demand are Ami Ayalon (former head of Shin Ben, former MK), Gen (Res.) Amarm Mitzana (formerly mayor of Yeruham and mayor of Haifa and Labor Party Chairman), Rabbi Michael Melchior, Alik Ron (Former Commander of the Northern Police District), Brig. Gen. (Ret.) Giora Inbar , Gavri Banai, Avi Buskila, Yuli Tamir (former Minister of Education) Ophir Paz-Pines (former MK) Gilead Sher ( Chief of Staff and Policy Coordinator to Israel's former Prime Minister and Minister of Defense, Ehud Barak), Daniel Ben Simon (former MK), Tzali Reshef (former MK), Noa Rothman, Uzi Baram (former Minister and MK), Emilie Moatti, Orni Petruschka, Riki Blich, Col. (ret.) Shaul Arieli (head of the Peace Administration under the Barak government) and many others. This morning, the founders of "decision at 50" sent a letter to Prime Minister Netanyahu, in which they demand the promotion of a referendum and requested a meeting with him. "A decision through a referendum on the most critical question for the future of Israel will be a statement regarding where Israel is heading and provide guidance to Israeli governments in their policy making on this crucial matter," the letter reads. Simultaneously, "Decision at 50" activists hung signs this morning outside of the homes of the Prime Minister and all party leaders, and a media campaign has been launched calling Israeli citizens to go on the initiative's website (www.mishal50.org.il), Facebook and Twitter and sign the petition calling for a referendum. Ami Ayalon of "Blue White Future:" Every day in which our control over the Palestinian Territories persists brings us closer to the end of Israel as the democratic state of the Jewish people. Netanyahu sees the disaster ahead, but he is not courageous enough to act. Due to the lack of leadership, it is our duty as Israeli citizens to determine our future. Only a decision made through a referendum will express the will of the people and allow us to continue and build the state of Israel without violence between us." Avi Buskila, General Director of "Peace Now: "for 50 years Israeli governments are deciding not to decide on the question of the Palestinian territories. This lack of decision is endangering us. We do not have clear and recognized borders and Israeli society is being torn apart by the most critical question for the future of Israel. This cannot go on. It is time to decide, and if the government won't do it, we, Israelis, will lead the way. On the 50th year of Israeli control over the Palestinian territories we are calling for a historic referendum which will illustrate whether Israeli citizens seek a one state or a two state solution in the long run."